Aryabhatta Knowledge University, AKU is public University primarily key for technical Education university. 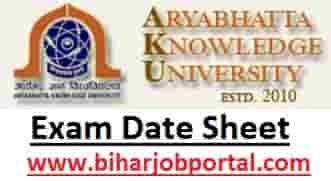 As every University this university conducts the exam as per notification rules so here we are going share Bihar Aryabhatta Knowledge University (AKU) Exam Date Sheet 2019. Aryabhatta Knowledge Unviersity (AKU), Bihar is Govt University. For technical Education this is a prestigious university. It provides many coursed in the campus which is given below. All Update regarding AKU Exam Date is update here. You can check detail.